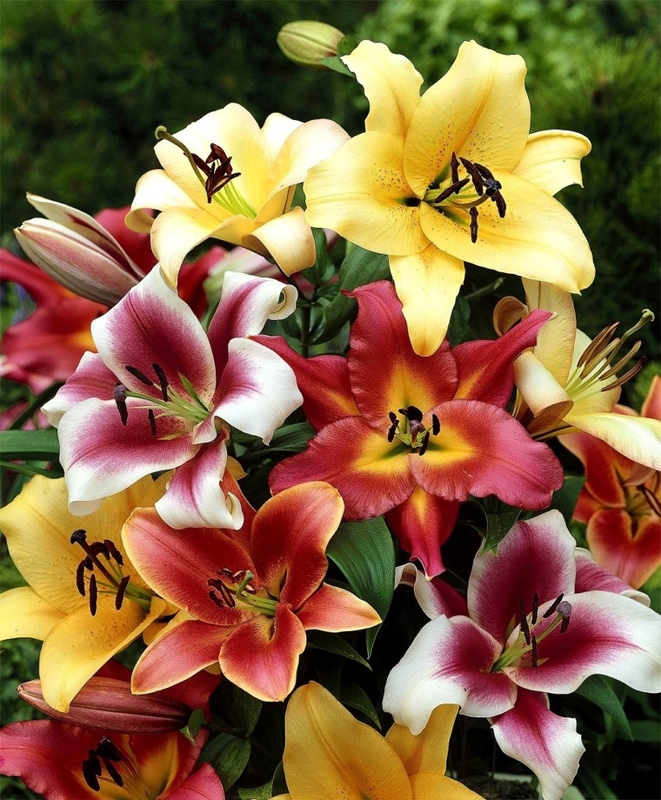 Our fragrant, imperious mixture of outward- and upward-facing Orienpet Lilies includes a colorful spectrum of ivory, yellow, pink, apricot, burgundy and red bicolors. Bred by crossing Oriental Lilies with Chinese Trumpet Lilies, these OTs or Tree Lilies have a subtle fragrance similar to that of roses and raspberries. They have thick stalks and immense, substantive flowers with a slightly waxy feel and gently recurved petals. Lily Class: Orienpet. Bulb size: 14/16 cm. Plant 6" deep and 12" apart. July/August. HZ: 4-8. 3' to 6'.